This Sulwhasoo review will first focus on the individual products and then as a whole. 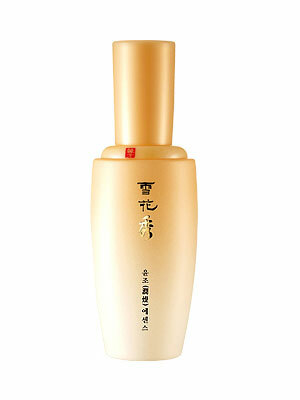 Sulwhasoo First Care Serum has the color of healthy maple syrup, and a smooth, fresh consistency. Two small pumps is enough to cover your face, yet it does not have a dramatic impact on skin. Most serums leave a sticky tight residue, but First Care Serum hardly leaves a trace. Though it feels comfortable, one wonders if it actually does anything a serum is supposed to do. Sulwhasoo Balancing Water alone is not much use. This “gel-based toner” refreshes the skin and leaves it feeling clean — without any miraculous effects. However, the beauty of this product occurs when paired with the Sulwhasoo Balancing Emulsion. 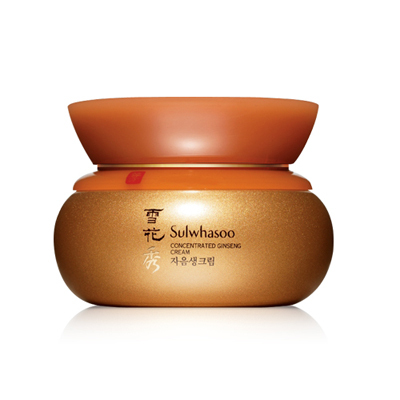 Sulwhasoo Balancing Emulsion is the standout product of the set. The best feature of the Emulsion is that you can use it alone and bypass the whole time-consuming skin care ritual. It provides nearly instant hydration with fresh, yet minimal, fragrance. Sulwhasoo’s Balancing Emulsion leaves an overall dewy texture and is an absolute pleasure to use. Sulwhasoo Concentrated Ginseng Cream Review is meant for anti-aging purposes, which means it’s the most expensive product in the line. As described in my other Sulwhasoo article, the Concentrated Ginseng Cream is VERY earthy and completely unlike typical chemical-enriched anti-aging creams. If you have ever peeled back the skin of a weed, such as a dandelion, and smelled its milky white insides, the Ginseng Cream mimics the same sharpness. Your initial reaction may be of disgust or earthy admiration, but the smell fades away in seconds and your skin is protected with a shield of moisture. What the Sulwhasoo set boils down to is a serum, toner, moisturizer, and cream. The serum provides a nice base for the Balancing water, but doesn’t feel necessary. Skin will feel like a clean slate if the Sulwhasoo Balancing water toner is applied afterward. Best of all, the toner acts as a magnet to Sulwhasoo’s Balancing Emulsion, and together, they provide great moisture. Additionally, the Concentrated Ginseng Cream acts as a wonderful shield, particularly against frostbitten weather. Buy Sulwhasoo Balancing Emulsion alone or opt for both the emulsion and Balancing Water. For icy climates, the Concentrated Ginseng Cream works wonders, but don’t expect it to permanently reverse time, as no product really ever does. Hello! I’m an advertising student at The University of Texas at Austin and our client for our semester project is Sulwhasoo. I was just wondering how you heard of this product line, and if you think this will be successful in the US market. I am not very familiar with the beauty industry so any insights would be greatly appreciated! You can email me at alessandra.ginsberg@gmail.com thanks! i read about sulwhasoo products in parenthood magazine. i like to know besides changi airport selling it, where other shops carry. i like to know about the products. You can find the Sulwhasoo products on Berdorf Goodman’s website. I got Sulwhasoo Fingerlinic Massage Cream from my friend. But I can’t read Korean. Please tell me the product features and usage. I’ll try to get my hands on it as soon as I can, but only if they sell it in the US. I’ll have to look into that for you, I haven’t used it yet! Can you please clarify whether I use the Sulwahsoo First Serum BEFORE the Balancing Water? Isn’t the Balancing Water a toner hence to be used prior to putting on the serum? I’m confused. Please explain since I’m purchasing these products and I would like to use it properly. Your assistance is greatly appreciated. Thank you very much. Hi Sharon, in comparison to the other toners I have used in the past, the Sulwhasoo balancing water is quite thick. Therefore, to get the benefits of the serum I recommend using it first. You are right in that it is generally accepted to use the toner and then serum, but I just felt that it wasn’t right for me, and individuality is what skincare is about. Feel free to take my advice or leave it! btw, would you recommend Sulwahsoo brand or the Amore Pacific brand? I am actually in the middle of using the Amore Pacific Time Renewal line and am loving it less than Sulwhasoo. Sulwhasoo is definitely the way to go if you like natural lightweight and fragrance-free skincare products. I think it depends on how you feel but…the First Care Serum SHOULD be used first; then the Balancing Water; then the Emulsion. I’ve used this combination for over a year and it works extremely well. The Serum contains Membranous Milkvetch, which helps circulation and Dwarf Lilyturf and Licorice to boost synergy amongst the herbal extracts. I have found my skin breaks out far less, it looks clear and dare I say almost luminous. And I have problematic, combination skin. Can you tell me whether I need first care serum ,balancing water, balancing emulsion then… Snowise (sun damage) or Ginseng cream (mature skin)? I can only afford one of the creams! I honestly loved the balancing water + emulsion paired together. But if you have mature skin and only can use one, I would only suggest the ginseng cream. I never used the snowise so I can’t give any advice in regards to that!